Like in Generation V, Mystery Gift is not unlocked by any special password. Instead, the Mystery Gift feature is available on the menu immediately. This will allow you to easily be able to get Mystery Gift and be able to access the gifts when they come. You will see three different options in the main Mystery Gift menu; Receive Gift, Card Album and "Hear Explanation", the latter will give you in-depth details on what to do in a variety of situations including if your card album gets full. Get from Internet is exactly what it says on the tin. Using the 3DS's Wi-Fi Internet abilities, the game connects to the Internet servers and looks for any Wonder Cards that Nintendo has put up. The next feature is a feature that will be used at some events, possibly replacing Slot2 distribution. Here, you can receive a Wonder Card through the InfraRed feature on the game card. This requires direct line of sight from the distribution machine. The next feature is the newest and provides Pokémon if you enter in a specific unique serial code. 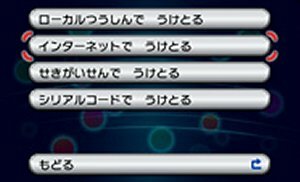 Once you enter the serial code, you will receive the special Pokémon. 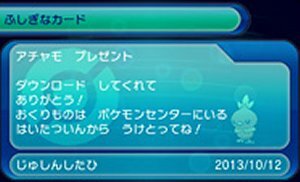 This works similar to the Serial Codes within the Pokémon Global Link in Generation V.
The Wonder Card option beneath the obtaining options in the Mystery Gift menu will allow you to check and manage the Wonder Cards that you have stored in the game. Unlike past games, you can now store up to 24 different Wonder Cards at any time and have the ability to sort through them quickly and easily, unlike in the past. When you select any of the Wonder Cards, you will view the card. Like previous wonder cards, this will give you the title of the Wonder Card and whether or not it has been collected. If you press the A button on the card, you will get the option to move the card's order, as well as the option to delete the Wonder Card. Only do this if you are running out of space and have received the items. On gifts which gave away Pokémon, a silhouette will appear on the Wonder Card. Click this silhouette on the Touch Screen and the Pokémon will appear and animate before disappearing again. 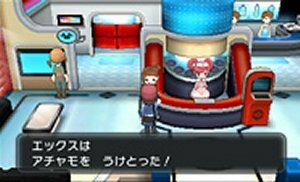 After you have received the gifts, you need to pick it up from the woman in the Pokémon Centers. 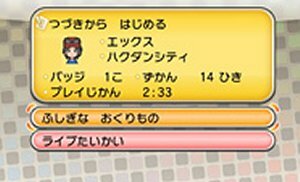 This gives you the actual item in-game and the delivery woman can be found in any of the stores within the game so you can get it anywhere. all you need is a free slot in your party.